Although you may not know John Barry (a free lance writer and historian), every American ought to know Roger Williams. Williams (1603-1683) established the Providence Plantation, later to become Providence, Rhode Island, under democratic governance with the only true separation of church and state in the world. Williams is also regarded as the cofounder of the first Baptist church in America in 1637 in Providence where he was baptized but then later withdrew from the church feeling his baptism was not sufficient. His friend and colleague John Clarke later started a Baptist church in Newport. Williams was an amazing man and statesman both in England and America. He personally worked under Sir Edward Coke, and knew Francis Bacon, and even Oliver Cromwell. In America he was friend and adversary of John Cotton and John Winthrop (Sr. and Jr.). Williams had learned under Coke to disagree with the divine right of kings which James I forcibly believed and practiced in England. 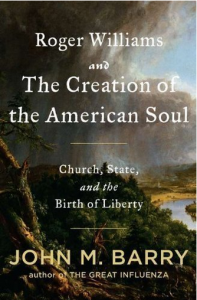 But Williams also came to disagree with the Puritans who, though disagreeing with that doctrine, however believed in a union of church and state, their church being the director of the state. Williams was excommunicated from Salem, Massachusetts over this issue and lived among the Indians in the wilderness who subsequently sold him the land that became the Providence Plantation. It was here that Williams developed true separation of church and state. Williams was a moral and religious man but believed that the state cannot govern the religious or moral life of people unless civil laws are broken. He overtly disagreed with the Quakers (even debating them multiple times) but defended their right to practice their religion in Rhode Island, whereas they were persecuted and even executed in Massachusetts for their faith. God’s providence can be seen throughout Williams’ life as God made a way for Baptists and others to practice their faith freely.